I’m currently working on a guest room makeover for a client. For all of my interior projects, I like to incorporate unique pieces that cannot be bought at a store. If you can find everything I do in a store, why hire a designer, right? Ahhhh … Annie Sloan Chalk Paint™! We’re using this particular paint because it’s my favorite, but also because it allows me to be really creative with the wooden signs. 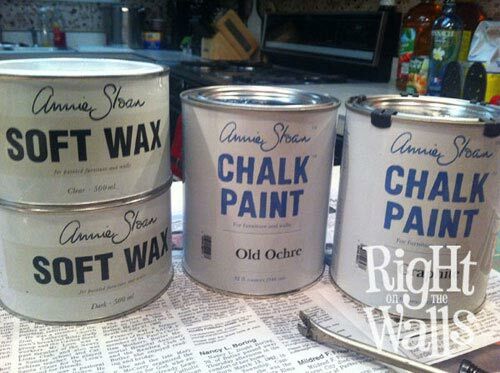 Annie Sloan Chalk Paint™ is not to be confused with chalkboard paint found in your local hardware store. No, no, no! This Chalk Paint™ is a specialty paint that needs no primer or sanding … it can be used as a limewash, to add texture or dimension to your piece … age, or even bring out the grain of wood. Chalk Paint™ has a matte finish, so it’s best to make long strokes with your paint brush WITH the grain of the wood. I painted one side of the bath sign ovals with the color Old Ochre, waited 12 hours and then flipped them over to paint the other side. After carefully measuring the wooden ovals, our design team made me a sheet of vinyl wall art decals to act as stencils. Who knew? Vinyl wall decals can be a great stencil for painting words on walls, furniture, craft projects … the list goes on and on! I used the supplied application tool from Right On The Walls to apply my vinyl wall art “stencil” to the wooden ovals as directed in the instructions provided. 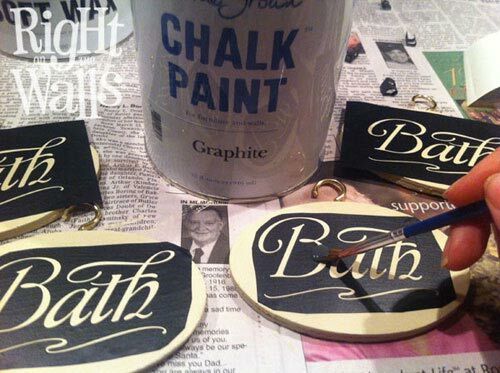 Next, I grabbed Annie Sloan’s Chalk Paint™ Graphite to paint in the stencil area on my bath sign. Be very careful not to get the paint outside of the letters, and don’t go too heavy with the paint. 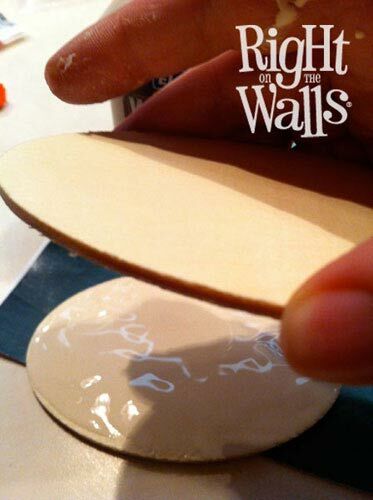 Allow the paint to sit for 12 hours and remove the excess vinyl wall art decal from the oval. I only painted a single layer of the graphite paint. I did lightly go over the letters with a piece of low grit sandpaper, just to give the letters a slightly aged look. 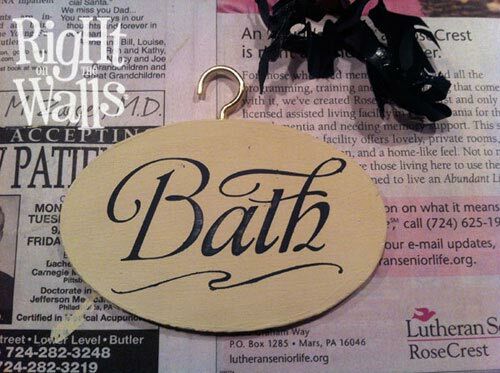 Now … wax the entire wooden oval bath sign plaque using Clear Soft Wax with a lint-free cloth or a wax brush. 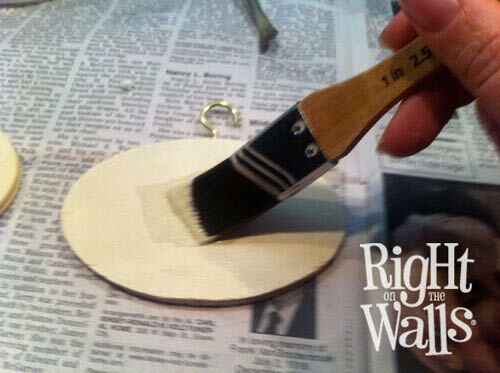 For this step, apply the wax in the same direction as your paint. 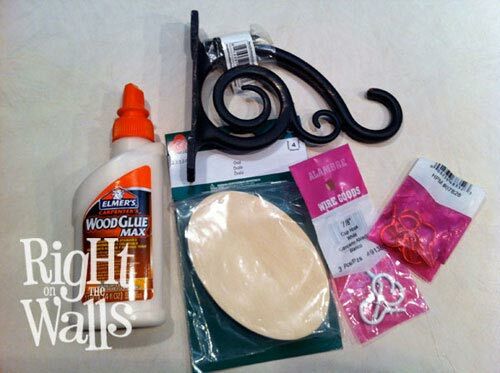 You don’t need much wax to cover these small ovals, so use sparingly. You will notice that the wax will darken the paint slightly. Allow 12 hours to dry. 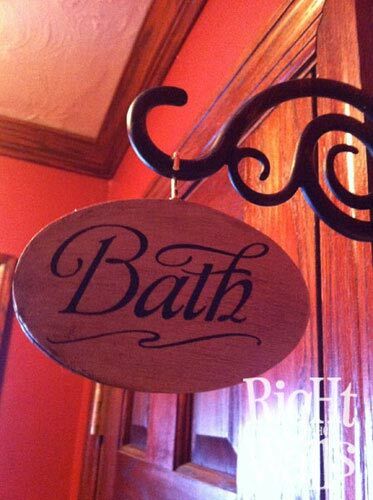 Next, to make my bath sign look more rustic, I’ll follow up the clear wax with Dark Soft Wax. 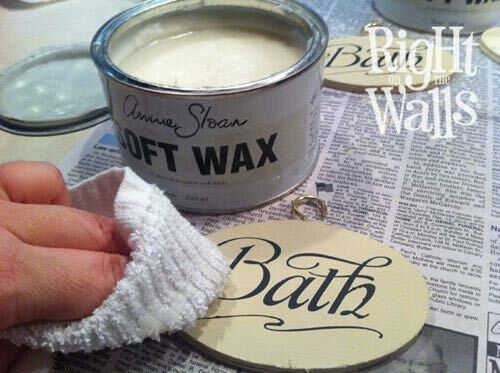 Again: be sure to use long strokes to apply the wax evenly over the sign, following the grain of the wood. 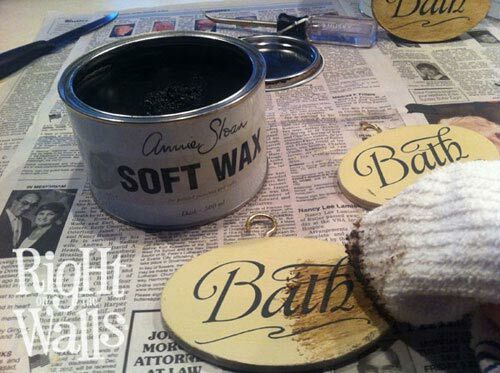 Remove any chunks or imperfections in the dark wax by lightly skimming across the oval with a clean portion of your rag, and allow the wax to dry completely. When the dark wax has dried, you may want to buff it. 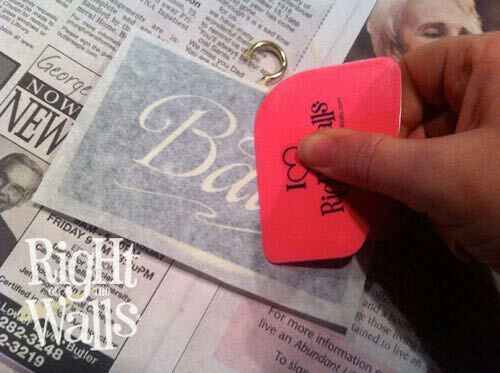 Rub slowly and in good lighting to buff lightly with a soft rag to increase shine. This little delightful piece will hang at the top of the guest bath door moulding — high enough for tall persons to walk under — but low enough to be seen and admired! Whatever your project, we’re here to help! If you’d like to use wall decals as a stencil for your next project, please contact our team with details!